Three members of one family were killed in a crash outside Megiddo. A baby was found alive but hurt in the backseat. Three members of one family were killed Sunday in a crash near Megiddo. The victims were traveling in a jeep that collided with a tractor. A man and woman thought to be in their late 30s or early 40s were both killed, as was a boy approximately five years old. Two others were injured in the crash. Paramedics who arrived at the scene saw that the jeep had been crushed, and that there was no hope of saving the three fatalities. They then heard crying, and peered in the backseat, where they saw a baby on the floor of the vehicle. The young child was conscious. 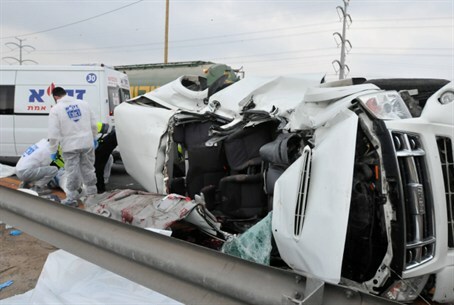 He was airlifted to Rambam Hospital in Haifa, where he is in moderate-to-serious condition with a possible head wound. A second person who suffered injuries is in light condition. The victims’ identities have not yet been made public.